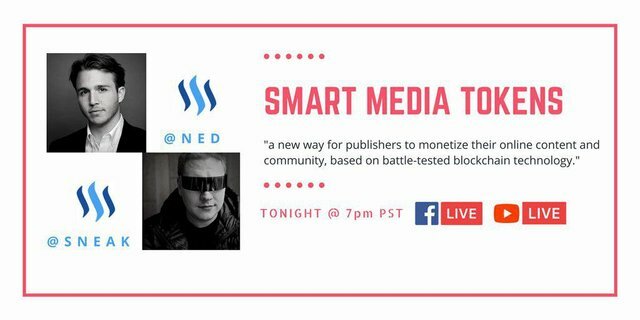 Steemit Founder and CEO Ned Scott (@ned) discussing the vision of Steemit and their latest announcement, Smart Media Tokens "a new way for publishers to monetize their online content and community, based on battle-tested blockchain technology." Smart Media Tokens (SMT) give ”anyone the power to launch and sell Proof-of-Brain tokens, which are tokens distributed by “upvote” and “like”-based algorithms”. For more detailed information, visit the SMT whitepaper. I may not have received the upvotes for my post on this but at least I got the last question to @ned! I feel like reputation is a huge deficiency in SMT - a pure up/down vote system that a comment system would give you out of the box is pretty weak IMO. It would miss out on all the stabilizing influences of reputation so each site would have build and figure out for itself. A troll could flip from SMT to SMT to SMT starting afresh each time. Figuring out how to federate it (optionally) across SMT tokens would be a huge incentive for people to come to and stay at SMT powered sites or for publishers to add SMT to their sites. Maybe the oracles Ned mentioned could be used to spread reputation around by "witnessing" good behavior? And maybe the sharing of voting rights he mentioned could also help. But I really feel like you need to have something pretty compelling out of the box to differentiate Steem from Disqus et al. and take the network effect to 11. Perhaps a separate SMT entirely could be used to embody a federated reputation? Good question. I think you asked it too late, and he was trying to wrap up.. It does sound like he has many interested parties and they want to try out his ideas.. Keeping in mind many have no idea what they want, they are trying Ned's pie. But it does look like Ned is trying to perfect his pie so he will have a large line waiting outside the front door, each day. Much of this seems economically driven; has nothing to do with Steemit blogs, and could take a very long time to see come to fruition. I'm guessing those oracles could be a lot, lot juicier than a reputation system at the moment. I think I obsess on the latter a bit because the NYT comment system keeps being used as an example. Maybe he has in his head how it works but really as a pure comment system I don't see how the economics of it work. You provide a comment system which saves people the effort of building one - but they could get it from Disqus with an existing user base. Sure the commenters can earn NYT coins but who provides the money to give those value - if it is "investors" not users then what causes their value to increase? Are commenters going to sink money into NYT to bump up the reward their upvotes give? Or bump up with comments to the top? That seems unlikely and a bit antithetical to a good commenting community. Buying a media token if you are a publisher on a site seem much more likely to me but only NYT is a publisher on their site. Unless of course Ned thinks that advertisers should publish their ads and have the platform count clickthroughs or impressions by users as upvotes. Sure you could do that but it seems far from what he has talked about so far - maybe because morphing Steem into an ad-network powering token might be rather unpopular with it's current base community. Let a few SMT users build that with the tokens and morph the platform that way and you can say "oopsie, didn't see that coming ;-)"
The way I think it should work on NYT is that they commit to using a share of revenue from ads to buy tokens. A successful commenting system means more eyeballs on content which means more ad revenue which means more tokens bought which drives up NYT token price which means more people want to be commenting etc. etc. That would however require NYT to provide an unpresidented degree of transparency about ad-revenue. Or maybe they should partner with Basic Attention Token and Brave browser folks and build a system that automatically funnels some of the BAT earnings from ads to buy NYT tokens. If I'm not mistaken (some of this is over my head), he did speak to the idea that advertisers could influence posts by purchasing tokens. Did I understand that correctly? Yes he did and that already works for Steemit as "promoted" posts (or even comments). However it is really not clear how that would apply in the NYT example - or anyone trying to use a pure comment system. Unless advertisers are going to be inserting comments with ad images in them so they appear below a relevant article mixed in with regular comments. But I think as a commenter I would find that annoying and people would be downvoting ads all the time, and an advertiser I'd probably not find that a compelling system to use. But I suppose someone could use SMT only as an ad content system, not for comments (or independently of comments on the site which would use a different token). So advertisers would buy the NYTAD token and then create adverts which would be placed on pages and then they use NYTAD tokens to promote their ads above their competitors. In that system I don't think there would be voting or author rewards - it doesn't really make sense to me, no one would vote on ads anyway and the economic system of ad/publisher reward makes no sense which leads me to think it isn't a good use of SMT as is. My idea of using BAT makes more sense to me but is more complicated. Was there, and it was a great chat and interesting to see how many players there now are in the 'Token-as-a-Service', 'Coin-as-a-service' model. I think SMT's focus on a niche and lessons from Steemit will be beneficial as a differentiator. Thanks so much for posting this. It is interesting to see Ned talk about his new baby, but there is so much he's not talking about. It's a real wait and see kind of thing; when we don't see updates to Steemit in many months..
You're probably right. It is a wait and see, but big takeaway I had from last night was that this blogging platform or Dtube or Dsound is almost like a testing ground for their main product, #SMT. 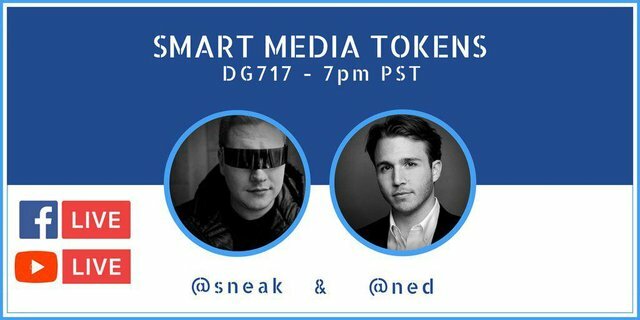 I'm very intrigued by these smart media tokens and think that the general public could build nicer platforms than #Steem currently has running. im watching right now ! Dude thanks for throwing up the livestream replay. The more we learn the better. Yeah, dude. We need to keep up. This is the reason that the @sargento follows you. Thank you for this post that keeps new gals and guys like myself informed. Kudos from a grateful follower. Have a great week. You are an appreciated Steemian. Steem On! A post with very useful information to help us in the future , thanks !! Congratulations, your post received one of the top 10 most powerful upvotes in the last 12 hours. You received an upvote from @thejohalfiles valued at 99.32 SBD, based on the pending payout at the time the data was extracted. Daily Learn some new from your post. Love to read it. your post is very interesting, I am waiting for your next post. hopefully there are new things that i read. Congratulations @virtualgrowth, this post is the eighth most rewarded post (based on pending payouts) in the last 12 hours written by a Hero account holder (accounts that hold between 10 and 100 Mega Vests). The total number of posts by Hero account holders during this period was 212 and the total pending payments to posts in this category was $4437.34. To see the full list of highest paid posts across all accounts categories, click here. Great post and very informative. @virtualgrowth Have learnt a lot from it. This is not the right topic, but I am trying to contact @virtualgrowth on advice by @biophil regarding pockets exchange. Sent you my Pockets days ago and nothing got to my account on Bitshares!